Hugh David Stevenson was born in The Valley, a suburb of Brisbane on 24 August 1918 to the Reverend William Henry and Katherine Stevenson. His father was the Rector of Holy Trinity Church and later became Anglican Bishop of Grafton, New South Wales. His paternal grandfather was master of a sailing vessel, Chevert, plying between Sydney and Pacific Island ports and his maternal grandfather was William Saumerez Smith, Anglican Archbishop of Sydney. Hugh Stevenson was educated at The Southport School and participated in most sports including athletics, football, cricket and represented his school in rowing. There were three boys and one girl in his family. The boys all joined the services and the girl became a ballet teacher. The ultimate decision to choose a naval career was entirely his own although it was no doubt influenced by the stories of the sea related to him by his paternal grandmother when he was a young boy. His naval career began when he joined the Royal Australian Navy on 13 September 1932. His ambition from that day forward was to be captain of his own ship. The class of 1932 was known as the ‘Jervis Year’ and in later years it was to produce a a very high number of officers of senior rank. Upon graduating from Royal Australian Naval College he was Dux of the year and received colours in swimming, tennis, cricket and rugby. He was appointed, with the rest of his class, to the heavy cruiser HMAS Canberra in January 1936. 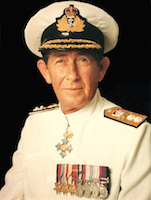 In later years when serving as Flag Officer Commanding, Australian Fleet, he said ‘When we joined Canberra Sub Lieutenant Victor Smith was in charge of cadets and later Sub Lieutenant Richard Peek.’ Both were destined for high rank and knighthoods. ‘Lieutenant Commander Dechaineux as Torpedo Officer was our ‘Snotties’ nurse.’ Late in 1936 Canberra visited Adelaide on the occasion of the city’s Centenary Celebrations. Promoted midshipman that year he left the ship in early 1937. Midshipman Stevenson was posted to the Mediterranean where he joined the battleship HMS Queen Elizabeth, flagship of the Mediterranean Fleet. The Spanish Civil War was raging at this period and the fleet found itself involved in a passive role. He served also in the cruiser Devonshire and the destroyer Garland. The Abyssinian War required patrols in the Eastern Mediterranean and young Stevenson obtained valuable knowledge of the area, which was to become a principal theatre of naval war in World II. During the period May 1938-January 1939 he completed sub-lieutenants's courses in the United Kingdom. On his return to Australia he was posted to HMAS Hobart. He was serving in the cruiser when promoted to lieutenant early in 1940. The war brought new dispositions to the Australian Fleet and Hobart served in the Red Sea area in the second half of 1940. Her involvement in the Somaliland Campaign is well documented but suffice to say it introduced Lieutenant Stevenson to war. In August 1941 he joined the new N class destroyer, HMAS Napier, leader of the 7th Destroyer Flotilla. The destroyer arrived in the Mediterranean at the most crucial period when the Greek and Crete Campaigns were drawing to their unhappy conclusions. Napier also joined the Tobruk Ferry Run and participated in the desperate convoys to Malta. While serving in this ship he had many opportunities to meet the troops who fought ashore. Napier served a short period with the Eastern Fleet in the Indian Ocean and was then detached to support the Allied invasion of Madagascar. One of the interesting operations of this latter campaign was the landing of commandos at Morondava, halfway down the west coast of the island, and Stevenson went ashore with them. In March 1943 he joined HMAS Nepal as First Lieutenant, still with the rank of lieutenant, which he held until after the end of the war. During his time on board Nepal served mainly in the Indian Ocean. In 1944 he returned to Australia en route to the United Kingdom to undertake the Long Navigation Course. Before he sailed he took one of the most important steps in his life and one that no doubt had a steadying influence on his naval career. On 18 April 1944 he married Myra Clarke of Melbourne at St. Peters Church, Eastern Hill in Melbourne; they later has a son and a daughter. He left for England in April 1944 and after completing the Long Navigation Course he returned to Australia he was appointed to HMAS Napier as Flotilla Navigating Officer. Stevenson was to remain in this ship until the end of the war. As a matter of interest Napier was to be his first command, although only temporary. This happened when Captain Herbert Buchanan, in charge of the first British landing force in Japan, went ashore at Yokosuka and Lieutenant Stevenson steamed the ship into Tokyo Bay. On his return to Australia he joined HMAS Swan for two years. His commanding officer was Captain Ross Wheatley and as Flotilla Navigating Officer of 20th Mine-sweeping Flotilla he had the opportunity to get to know Captain Wheatley well. Lieutenant Stevenson was mentioned in dispatches in 1946 for his war service. He was posted for a short period to HMAS Watson as Coordinator of Training and then returned to England to complete an Advanced Navigation Course. He was promoted to lieutenant commander in 1948. Stevenson’s next ship was the cruiser HMAS Australia. His posting was as Fleet Navigation Officer but as personnel were in short supply at this period he also carried out the duties of First Lieutenant. While serving in Australia a collision occurred in Sydney Harbour which had an interesting sequel. The Navy won the case not only in the Supreme Court sitting in Admiralty but also the appeal in the High Court. It was one of the few cases of this nature where one side recorded a 100 per cent victory. In 1952 he was promoted commander and served once more under Captain Buchanan as Navigating Officer of the aircraft carrier HMAS Sydney. His next appointment was as Director of Administrative Plans followed by a term as Director of Plans. He joined the aircraft carrier HMAS Vengeance, serving under Captain Otto Becher, in 1954. The carrier was Fleet Training Ship at this time and was dispatched to Japan to ferry No 77 Squadron, RAAF back to Australia after their service in the Korean War. Vengeance was paid off at Devonport Dockyard late in 1955 and Commander Stevenson commissioned the new aircraft carrier HMAS Melbourne at this yard. There followed a particularly interesting period of service in the United Kingdom. After completing the Royal Navy Staff Course, at Greenwich, Commander Stevenson served with the Admiralty on the staff of Lord Louis Mountbatten, First Sea Lord, spending a term of two years in the Tactics and Staff Division. In 1958 he was promoted captain. He commanded the destroyer HMAS Tobruk and was Captain (D) in 1959-60. Shortly afterwards he was appointed captain of HMNZS Royalist, New Zealand’s only cruiser. This period, 1961-62, was a very happy time and Stevenson considered himself very lucky in obtaining the cruiser command in a period when cruisers were being phased out. He returned to Navy Office, Canberra in 1962 as Director of Plans. During this appointment he made his permanent home in the national capital. Command of HMAS Sydney came in 1964 and later that year, following the unfortunate Melbourne-Voyager collision he assumed command of Melbourne. During 1966 he returned to the United Kingdom for studies at the Imperial Defence College in London. His return to Australia in 1967 coincided with his promotion to commodore. His next appointment was Naval Officer in Command Western Australia and Captain of HMAS Leeuwin, the Junior Recruit Training Establishment. Stevenson was promoted rear admiral in 1968 and appointed as Deputy Chief of Naval Staff. In January 1970 he became Flag Officer Commanding Australian Fleet. On completion of this seagoing command he returned to Canberra as Chief of Naval Personnel and 2nd Naval Member. In the New Year's Honours List of 1973 he was appointed as a Commander of the Order of the British Empire (CBE). Stevenson’s crowning achievement came on 23 November 1973 with the announcement of his appointment as Chief of Naval Staff (CNS) and promotion to vice admiral. As CNS he served under Admiral Sir Victor Smith, Chairman of the Chiefs of Staff Committee. He was to hold this coveted post until his retirement on 22 November 1976. It culminated 45 years of loyal and devoted service to the Royal Australian Navy and his country. Further honours were bestowed on him; he was made a Companion of the Order of Australia (AC) in 1975 and following his retirement he was made a Knight Commander of the Order of the British Empire (KBE) in 1977. Vice Admiral Sir Hugh David Stevenson passed away on the 26 October 1998.